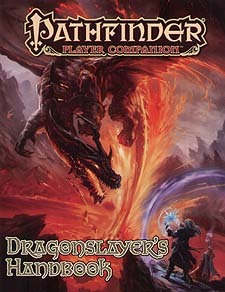 Prepare yourself to do battle with the ultimate monsters with Pathfinder Player Companion: Dragonslayer's Handbook. Discover the secrets of dragonkind, from devastating red dragons to venomous wyverns. Learn how to survive battle with ravenous wyrms, but also how to manipulate such creatures through guile, or even capture them alive. Master the right tactics to employ in battle against dragons of all types, including how to locate and survive their treacherous lairs - the homes of their legendary hoards. Once you know your foe, join the ranks of the Inner Sea's greatest dragon hunters, learn their tested methods, adopt their lethal gear, and employ their massive, dragon-fighting war machines. New archetypes, feats, spells, magic items, and more give you the edge against even the deadliest dragons.